Five instances of SCP-3375 at the Aquarium Berlin in Germany. Two SCP-3375 instances, having recently finished a meal at the Monterey Bay Aquarium in Northern California. SCP-3375 instance in Sea Life London Aquarium, awaiting delivery of food. Special Containment Procedures: All publicly-operated aquariums in North America and Europe hosting 500 or more species are to be monitored for the appearance of SCP-3375 instances. In the event that SCP-3375 instances are noticeably documented appearing in public view, a Foundation disinformation department team is to disseminate a story indicating that the presence of SCP-3375 was part of a trial-run “special event” involving trained animals on loan from a private institution. All staff of affected aquariums will be debriefed with a similar cover story. Coinage left by SCP-3375 is to be collected and stored in the nearest Foundation-owned facility. Writing left by SCP-3375 is to be removed using methods that are not obtrusive to aquarium inhabitants and onlookers. 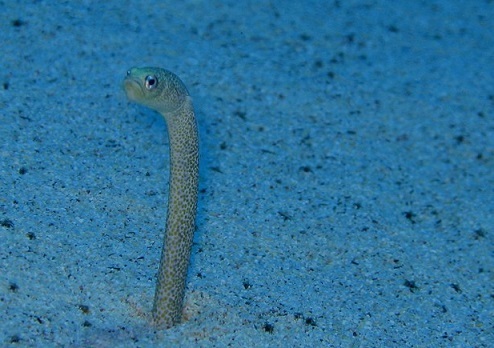 Description: SCP-3375 refers to an anomalous population of Heterocongrinae (garden eels) observed to spontaneously manifest in public aquariums in the North American and European continents1. SCP-3375 instances appear and generally behave identically to their non-anomalous counterparts. 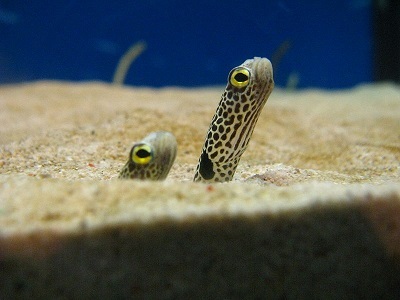 According to the limited collected data, SCP-3375 instances will typically manifest2 in large aquarium displays with sandy substrate ideal for burrowing, and emerge headfirst from the substrate during regular scheduled feeding times. SCP-3375, unlike their non-anomalous counterparts, will readily consume any small pieces of food present, and remain undisturbed by the presence of other animals3 in the area. Following the feeding period, SCP-3375 will retreat into the substrate, and after a period of 30 to 60 seconds, will reappear holding a single siglos4 coin in its mouth. An SCP-3375 instance will then deposit the coin on the substrate and withdraw into the burrow it originated from. Once SCP-3375 is no longer in view above the substrate, any evidence of the burrow it apparently occupied disappears. Coins produced by SCP-3375, while in unusually pristine condition, exhibit no anomalous properties. If no food is introduced to the tank at the time of SCP-3375 manifestation, SCP-3375 will remain at its burrow and placidly observe nearby fish. Should SCP-3375 be kept waiting for food longer than 10 minutes, it will retreat into its burrow without producing coinage5. On rare occasions, usually involving multiple instances of SCP-3375 manifesting in the same location, the first SCP-3375 instance to appear will leave its burrow and seek out the nearest flat surface. The SCP-3375 instance will then use its tail to deposit a layer of dark-colored mucus6 to form the script “سپاس”7. Upon such an act being performed, the SCP-3375 instance will return to its burrow, and all SCP-3375 present will each produce the typical siglos and collect the coins into a small pile, with the first SCP-3375 adding an additional siglos to the top of the collection. It is noted that SCP-3375 manifest exclusively in water environments that differ widely in animal and plant population from those preferred by their non-anomalous counterparts. 1. Of note, individuals of the Heterocongrinae subfamily are native to the Indo-Pacific region, as well as the Atlantic and East Pacific. 2. Though singular instances of SCP-3375 have been known to manifest, it is more common for two or more SCP-3375 instances to appear together. 3. SCP-3375 instances will quickly retreat back into their burrows if a human approaches with the intent to extract it from the burrow. 4. A silver coin issued by the Achaemenid Persian Empire from 520 BCE-450 BCE to 330 BCE, weighing approximately 5.40 to 5.60 grams. 5. As of ██/██/██, this behavior has been observed in three public aquariums. Despite increased Foundation surveillance of the facilities, none of the three aquariums were visited again by SCP-3375. 6. Lab analyses currently cannot be performed, as the mucus dissipates upon attempt to collect samples. 7. Pronounced "sepâs", from Persian سپاسگزارم "sepasgozaram" (səpasgɔzaræm), translated “I am thankful” or “thank you”.